Holyrood Park and Arthur's Seat are both very popular attractions in Edinburgh, only a short walk from the centre of the city. No trip to Scotland would be complete without a hill walk. And if you're staying in Edinburgh, then you don't need to venture far! Holyrood Park and Arthur's Seat are just half a mile from Princes Street. A huge expanse of parkland with dramatic cliffs and an extinct volcano, which you can see from all over the city. This area was once a royal hunting estate, before King James V turned it into a park in the 16th century. There are many beautiful walks around the park, with something for all abilities. You can stroll around St Margaret's Loch and watch for geese and other wildlife. Or, take a hike up the 'Radical Road', a scenic walk around the base of the Salisbury Crags cliffs. If you're feeling adventurous, you can climb to the top of Arthur's Seat for spectacular views of Edinburgh. The magnificent Arthur's Seat is an extinct volcano within Holyrood Park. It is the highest peak in a group of hills at the centre of the park, sitting next to the Salisbury Crags cliffs. Arthur's Seat can be climbed from almost all directions, and there are several routes of varying levels of difficulty to choose from. You can even drive part-way up for a shorter walk. Those that reach the summit are rewarded with stunning panoramic city views. If you're looking for self-catering accommodation in Edinburgh, within walking distance of Holyrood Park and Arthur's Seat, look no further! 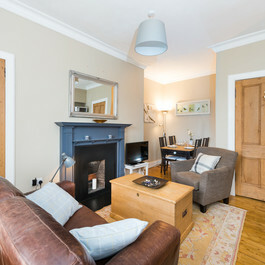 Here at Lets Get Local, we have a range of holiday homes close to Holyrood Park. Please take a look and get in touch if we can help you to plan your visit. There are currently 29 Michelin Star Restaurants in Edinburgh. Take a look at this selection of our personal favourites.